Traveling one day with my daughter in the train I've realized that I've forgot at home her favorite snack banana and bread. No, this is not banana bread but 2 different things :) that she loves. Lucky me, a good friend of mine joined the short train trip when the big cry of my daughter was about to start. What to eat, what to give... my friend had some chocolate cake with her and she proposed to my daughter. She ate the piece and asked for 2 more. Uh, that was a lesson for me.... not that I have forgotten her food at home (because sometimes just happen when you are in a hurry ;) ) but to make a chocolate cake as it has been quite a long time since I did the last one. So, next weekend, operation chocolate cake was ongoing and this is the recipe I've picked. I've replaced one of the ingredient Nutella with pure black chocolate grated. The cakes nicely raised but gave me some emotions when I have removed the first one out of the pan. It simply fall when turned over. Too much chocolate inside? No. Too early removed from the pan. Yes, you need to keep this cake in the pan for 15 min after taken out from the oven. I did this with the second one and turned out well. It is useless to say that this cake "disappeared" very quickly in the mouths of my family. Mix all ingredients together, except chocolate using a standing mixer. Cover the bowl and let it raise for 2-3 hours until the dough is double in size. Cut the dough in 2 (for 2 brioches) and stretch it with a rolling pin. Use a bit of oil on the table to avoid sticking. Sprinkle the half of the grated chocolate over the stretch dough. Do the same for the second one. 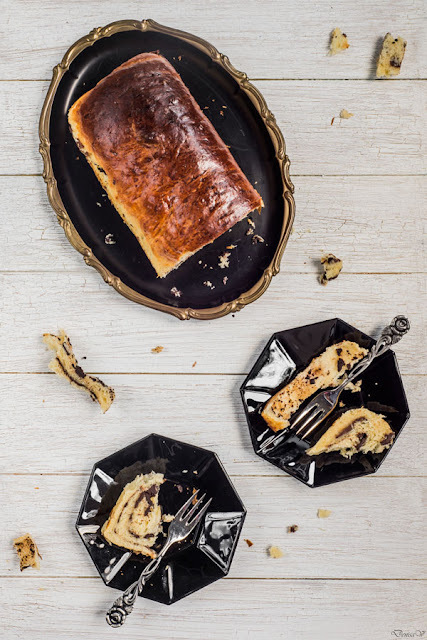 Roll the dough with chocolate and lay it in a long cake pan that initially was brushed with oil inside. Optionally, brush the brioches with egg yolk. Turn on the oven at 50ºC, put the 2 brioches inside and let them raise for 30 minutes. Increase the temperature to 180ºC and bake for 30 minutes. Let it cool for 15 minutes and then remove the brioches from their pans. Let them cool completely on a rack. Recipe inspired from Cuisine de copaines CCOP 016, page 103. That brioche looks beautiful. I use to work in a bakery and make brioche daily, in my experiences I have found that brioche can be difficult to work with. That being said it makes me appreciate a good brioche loaf or bun when I see it. Joy & Feast thank you very much. I really appreciate your comment.